“Quarterly iron ore supply contracts that are set to drive up the price of mass-market products such as cars, are not necessarily permanent, a leading steel industry executive has claimed. After years of pressure by the large mining companies and triggered by Chinese steel makers unwilling to follow benchmark prices the annual pricing system for iron ore has been replaced by a more flexible system. Ore prices in the new system are significantly higher than in previous years, leading to higher prices of steel products. 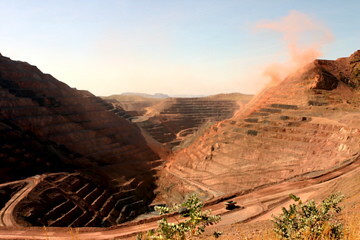 Eder hints at potential cartel-agreements between the large iron ore producers. Some steel makers suspect the miners keep prices high artificially through (illegal) price agreements. Eder’s comments will partly be driven by wishful thinking and partly by the knowledge that the best way to make future changes to the new pricing system possible is by keeping all options open. Parallel increases in ore prices can for a large part be explained by variations in mining costs (mainly fuel costs, but also changes in tax system), incurred by al miners. If the miners have nothing to hide, they won’t protest against investigations by governments into price fixing. If they do protest, they will raise suspicion. The executives of the major international firms try to convince the investor community during an investor presentation in February. Apart from the financial insights presented, investors can learn a lot from the slide decks presented. Comparing these decks provides insight into the Executive Vision, Executive Communication, and Professionalism of the Organization. Xstrata comes out on top of the presentation benchmark for 2010, followed by Rio Tinto. Vale’s presentation is the least convincing of the peer group. Investor presentations are the primary communication channel from public companies to the investor community. The opinion about corporate performance of investors can be influenced during these presentations, especially in the yearly meeting in which the financial results are presented. As in any presentation setting, the content of the board’s words shape the perception of the audience only for a limited part. The hearing experience (intonation, rhythm, etc.) and the visual experience (posture, gestures, presentation material) carry at least as much weight as the content of spoken words. The annual investor presentation slide deck is therefore arguably the most important deck produced by the company in the year. However, many companies put a lot of time in dragging together the material to be presented, but spend little funds and effort on the slide deck. This benchmark will analyze the investor presentation decks of the major mining houses to extract the implicitly communicated messages. What can we learn from the quality of the investor deck? There are three key messages that investors will consciously or unconsciously derive from the deck. Each of these messages is translated into two benchmark criteria as depicted in the image below. Firstly the deck will demonstrate the Executive Vision. The vision is communicated effectively through a logical and convincing storyline, in which priorities are clearly shown. Furthermore the contents of the deck will be balanced according to these priorities. In case the board is dominated by a single person of functional view, this will result in over-representation of this topic in the investor deck. The size of the deck should be limited, indicating the ability of the board to select the relevant messages. Secondly the deck indicates the quality of Executive Communication. The objective of the presentation will be to leave the investors with a limited number of messages, so these messages should be presented clearly. Each slide should have a clear meaning, presented in an effective and sticky tagline. Furthermore, the messages will need to be adequately supported by relevant and insightful data. Data presented should be driven by the messages the board wants to communicate, not the other world around. Too often the board members add their favorite graphs to the investor deck, without extracting any relevant insight from the data. Finally, the deck displays to what extent the board has build a Professional Organization. In order to make the most important presentation of the year, the board members will need to surround themselves with professionals. The corporate communication department, business units and executive advisors (often strategy consultants) will need to be led in an effective manner. This professionalism is demonstrated by visual appeal and consistency in terms and referencing. Unclear graphs, misaligned text, distracting graphics, lack of references and discontinuity of layout from slide to slide are typical features indicating amateurism. The decks are judged based on the criteria explained above. For each of the criteria a score is awarded on a 5-point scale, ranging from “very good” to “very poor”. The overall benchmark results are calculated as the average score over the six criteria. This study benchmarks the investor decks of BHP Billiton, Vale, Rio Tinto, Anglo American and Xstrata. Each of these companies presented the 2009 financial results in the period February 8 – 19 2010. The benchmark system for iron ore pricing is being replaced by a more flexible quarterly pricing mechanism linked to the spot market. The reduced certainty on iron ore purchase prices for steel makers will cause similar uncertainty in the price of their output. Steel makers are looking for various ways to reduce the new risk they are encountering. The most important will be to pass price increase on to customers, increasing steel prices globally. Reduced certainty on price of iron ore will impact investment decisions for both iron ore miners and steel makers, forcing them to adjust the time value of money in project valuation. Steel makers will increasingly opt for vertical integration, trying to secure a stable raw material base.